Governor-elect Janet Mills makes an appearance in the gallery of a Portland courtroom on Wednesday morning where the fate of Medicaid expansion was being debated. Mills has vowed to go ahead with the expansion. "I'm here to listen," Mills said. The slow march of a lawsuit aimed at forcing Gov. 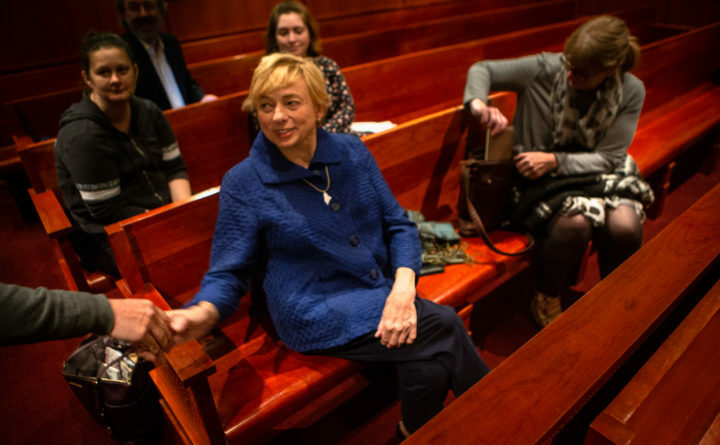 Paul LePage’s administration to implement the Medicaid expansion law that voters approved a year ago was overtaken by a political tide early Wednesday, as it became clear that Democrat Janet Mills will be Maine’s next governor. Mills — jovial and fresh off her late-night victory party — appeared in a Portland court Wednesday morning to listen to arguments in an advocacy group’s case against the Maine Department of Health and Human Services, which has failed to abide by an implementation timeline set out in the law. Earlier this year, LePage vetoed a funding measure put forth by legislative Democrats, saying that the spending plan relied too heavily on gimmicks, including Mills’ proposal to tap tobacco settlement money. Repeatedly blocking Democrats’ attempts to expand Medicaid under the Affordable Care Act has been a defining issue for LePage, who has contended that it would come with a lethal load of debt. Mainers’ vote for Mills, who ran on implementing the expansion to an estimated 70,000 state residents, stands as a clear rejection of a major part of the Republican governor’s legacy. She was voted in on a night when three traditionally Republican states — Utah, Nebraska and Idaho — followed Maine’s lead in expanding the government health care program through ballot initiatives. “I think the sense of urgency that the governor brought to this case has disappeared,” the Democratic governor-elect told reporters before the Wednesday hearing. The hearing was the latest argument in a lawsuit from Maine Equal Justice Partners that has already risen to the state’s top court. In June, Superior Court Justice Michaela Murphy ordered the LePage administration to submit a plan for implementing the expansion that voters approved through a 2017 ballot measure. The health and human services department appealed that decision to Maine’s highest court, which in September also ruled that the administration must submit an expansion plan to the federal government, but sent the thorny constitutional questions in this case back down Murphy. The Department of Health and Human Services complied with the Supreme Judicial Court’s order to file an expansion plan in September, but it was submitted with a letter from LePage urging the feds to reject it. On Wednesday, lawyers on opposing sides of the case repeated their core arguments to Murphy but seemed to be aware that the election results may render the legal fight moot. An attorney for Maine Equal Justice Partners, James Kilbreth, told Murphy the court should order the administration to implement the expansion retroactive to July 2, the original deadline for broadening coverage. Patrick Strawbridge, a Massachusetts lawyer representing the Department of Health and Human Services, asked that the case be dismissed as it touches on issues of spending he claims are beyond the court’s authority. Mills’ office, which declined to represent the LePage administration in the case, entered a brief supporting Maine Equal Justice Partners. “We don’t think this is a close call,” Assistant Attorney General Jonathan Bolton told the court. Murphy spent far more time Wednesday questioning Strawbridge than any of the other attorneys, and she appeared skeptical of aspects of his argument. The judge said she intends to rule as quickly as possible in the case. Either side could appeal her decision back up to the Maine Supreme Judicial Court, but it is highly unlikely that the high court would rule on an appeal before the occupant of the governor’s mansion changes. Asked whether the LePage administration would appeal a decision against it, Strawbridge declined to comment. As she left the courtroom, a reporter asked Mills if she has a funding proposal for Medicaid expansion. “Oh, absolutely,” she replied.